SpyCrushers spy camera owners can now view recorded video and images from their Android phone when using the free included SpyCrushers 4-n-1 USB/Android Card Reader. SpyCrushers , the online spy camera and hidden camera retailer, has added new hardware to a few of their product offerings called the 4-n-1 USB Adapter. 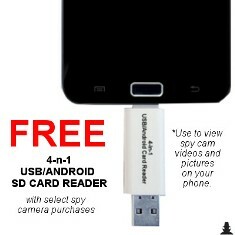 The 4-n-1 USB/Android Card Reader allows SpyCrushers spy camera users to view their recorded media on any Android smartphone. Spy camera users insert their spy camera products’ micro sd card into the 4-n-1 card readers’ micro sd card slot, then connect the card reader to an Android phone. Lastly, download and open the VLC Media Player app to watch recorded video and view captured images. The VLC Media Player for Android is a free media player app that can be downloaded from the Google Play Store. The 4-n-1 USB/Android Card Reader is currently included for free inside the SpyCrushers Pro Series 1080p HD Spy Pen Camera , the SpyCrushers Clothes Hook Camera and the SpyCrushers Smiley Face Spy Camera Button product offerings. The 4-n-1 USB/Android Card Reader connects to any Android phone through its Android USB plug. It also can connect to any computer when using the USB plug. There are two slots for sd card insertion. One slot is for a micro sd card and the other slot is used to insert a larger micro sd card adapter. Currently the spy pen camera, clothes hook camera and smiley face spy cam products can be found on Amazon, Ebay and SpyCrushers ecommerce websites. Purchase price range from $19.99 for the clothes hook camera, $24.99 for the smiley face camera and $29.99 for the 1080p spy pen. SpyCrushers spy camera products like the 1080p spy pen camera, clothes hook camera and smiley face spy camera all have a micro camera covertly installed. When activated the camera records video with audio, takes pictures and can be used as a Webcam when connected to any Windows PC. Each purchase includes a 30 day money back or new replacement guarantee. If customers are not satisfied with the product they can contact SpyCrushers via email for immediate resolution. Online shoppers can locate the SpyCrushers spy camera products on Amazon and Ebay when using the search word spycrushers inside any open search bar found on any Amazon or Ebay webpage.